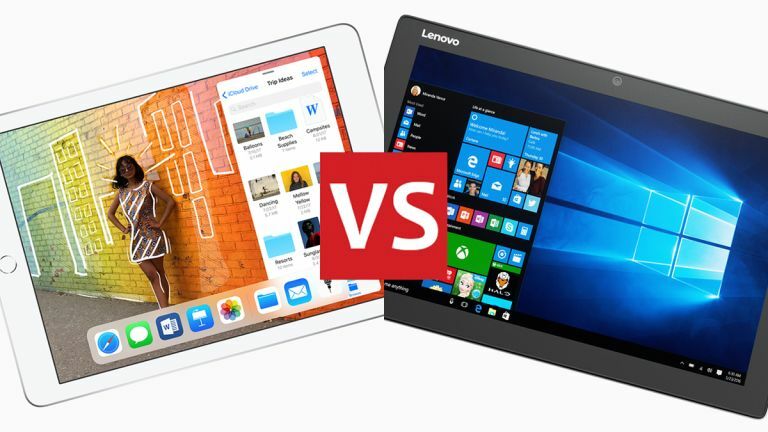 iOS vs Windows 10: what's best for your tablet? With Google apparently unconvinced by Android on tablets, if you're in the market for a large touchscreen device, you've got two main choices at the moment: the iPads made by Apple, and the tablets and 2-in-1s running Windows made by Microsoft and its partners. We're here to lay out the advantages and disadvantages of both, so you can make the wisest decision possible – you need to take prices and hardware specs into consideration, of course, but here we're going to focus on the qualities of the software platforms. There's no doubt iOS on the iPad is a slick and simple experience: iOS has been specifically designed for mobile, touchscreen devices after all, and it scales up pretty neatly when moving from the iPhone to the iPad. Unlike Windows, all the apps are geared towards mobile, touchscreen devices, too. Some can easily accept inputs from a connected keyboard, but for the majority of the time you're going to be tapping and swiping on the screen, and hitting the Home button, and iOS apps are specifically built for that. In recent years, Apple has put some welcome new features into iOS specifically for iPads. There's now an app dock, support for dragging and dropping content between open apps, and an improved split screen view for running apps alongside each other. This means iOS is now more capable and versatile than ever on an iPad – whether you want to play games, watch Netflix, or even open up a spreadsheet or two, an iPad can adapt. You don't get the same kind of file system access as you do on a full OS like Windows, but you do get the Files app and access to iCloud Drive. Searching through your tablet and browsing the web is all very straightforward, and of course Siri is always on hand to answer any questions or run any errands for you. You can sync iOS with iTunes on a Windows or macOS computer, but as you would expect it works better with Apple's own software (and hardware). As an added bonus, you can use iOS on an iPad as a HomeKit hub, enabling you to control your smart home from the comfort of your tablet screen – provided everything you've bought is HomeKit compatible, of course. Microsoft made the decision to put Windows on both regular computers and tablets back in 2012 with the launch of Windows 8. The tablet experience has come a long way since then, but Windows 10 still feels like a desktop operating system squeezed into a tablet device when you use it without a keyboard. The plethora of 2-in-1 devices now on the market, like the Microsoft Surface Pro, show that Windows can cope on tablets and laptops, or laptops that turn into tablets. The main problem is that third-party apps aren't necessarily geared towards tablet and touchscreen use, except maybe the ones made by Microsoft and a handful of others. You won't get access to anywhere near as many mobile-ready apps as there are on iOS: the likes of Snapchat and WhatsApp, for example, or mobile games. A lot of these apps can be accessed on the web, but where Windows 10 apps have been made – as in the case of Instagram – they're not particularly polished. On the plus side, having Windows on your tablet means you can run full desktop applications from your device as well – iTunes, Photoshop, Spotify, whatever you like. Browsers like Edge and Chrome run in full desktop mode too, so you're not restricted to websites putting themselves into mobile mode. Of course if you do attach a keyboard, then Windows 10 is very much at home – more so than in tablet mode. You can use all your office and productivity apps just as you would if you had a full laptop or desktop, and (depending on your device) you can probably hook up a mouse as well. Controlling everything is Cortana, which has its strong points and weak points, just like Siri. This being Windows though, it's guaranteed to work with a broader range of other devices and hardware than iOS is, from printers to external hard drives. These two operating systems come from different directions: iOS from the mobile side and Windows 10 from the desktop side. In a nutshell that tells you all you need to know about how these OSes work on tablets. For the most tablet-friendly apps and the most tablet-friendly experience, pick iOS and the iPad. Everything is geared up for mobile and touchscreen use, so it's perfect for travelling and getting stuff done on the go. On the other hand it's not quite as good as Windows 10 for productivity and serious work, or for full-fat web browsing. iOS works with fewer platforms and devices than Windows 10, though you can use it as a hub for HomeKit smart devices. If your other devices aren't all made by Apple, make sure they work with iOS before you buy an iPad. If you want to have access to full desktop apps like Photoshop and your web browser, and think you'll be spending a lot of time with a keyboard attached to your tablet, then go for Windows 10. You won't find as many apps built for mobile, and you might miss some of your favourites from your phone, but you'll be able to get by. The way that Windows is built now, it really is like taking a laptop experience and putting it into tablet form, whether you're using a genuine tablet or a detachable screen like the one on the Surface Book. It suits switching between those form factors. Both of these operating systems are packed with features and very secure and stable, so you won't be disappointed with either. A big part of your decision might depend on what you're already used to, and the devices you already use.